that enters your workshop, highlighting any concerns clearly and concisely. We help care for your customers. More than just a vehicle health check system, our iVHC application is intuitive, interactive and fully integrated with all other modules, including Video1st for video and photographs and Finance and Repair Plans for Red and Amber work upsell. Inject any previously unsold Red or Amber work concerns identified as part of an earlier iVHC on the vehicle automatically into the new health check as mandatory inspections. Videos and photographs help build trust with customers and our fully integrated products allow service advisors to record pre-inspection walkarounds and technicians to take a video while performing the health check. All unsold Red and Amber work concerns can be sent directly from Proactive Follow Up with the attached health check when they are due, with each type having its own bespoke timeline. Through their own personalised iVHC page a customer can view all identified concerns with supporting media and self-authorise this work through their laptop, tablet or mobile device. Ensure each dealership is engaged with iVHC by monitoring completion rates and red and amber work identification and upsell using our new Connect App. DMS integration, where possible, allows for a direct daily, incremental and/or manual download of job information from your DMS, as well as parts prices, stock availability and tracking. View your available tyre stock and place orders directly from iVHC through our full integration with major distributors. Never miss an update by using the client pop-up facility to notify you of any changes to iVHC’s which may require your attention, such as a customer authorising work online. Afford your customers the opportunity to spread the cost of any Red work concerns identified through iVHC over a set period while having the repair fixed on the day. Allow customers to pay monthly for Amber or deferred Red work concerns identified as part of an iVHC to increase customer satisfaction and retention levels. Call customers and record notes or assign a service advisor using the pre-call facility which highlights all relevant information, such as first visit notifications, last service dates, any recent health check information and full service history. Technicians carry out each iVHC using an App on an iOS or Android tablet device of your choice, selecting the relevant template, taking any necessary pre-inspection photographs and completing all mandatory checks. Price concerns and view stock levels in no time using the DMS* and tyre integration** facilities, selecting the correct parts with the help of photographs and videos and reduce parts obsolescence through automated parts status updates. Check your daily performance for sold, declined and deleted work through the live daily work screen, with departmental performance available through dashboards optimised for internet enabled TV’s. To ensure you are getting the most from your vehicle health checks, there are an extensive range of reports available to help you fully analyse performance by dealership, advisor and technician. 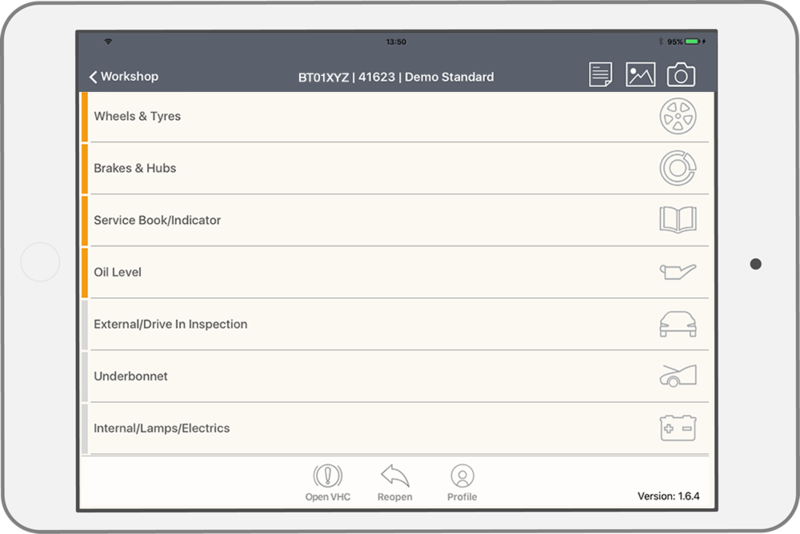 Gather a customer’s signature on a tablet device to authorise any work identified during a vehicle health check, up to an agreed value, to be completed without the need for further approval.